The man and artist that was Pierre Garnier is largely a mystery. He was born on May 10, 1847 in Lyon, a city which had its own thriving artistic culture outside that of Paris. In 1862, between the age of fifteen or sixteen, he became a student of Claude Reignier, a lithographer, at the École des Beaux-Arts in Lyon. After ten years of preparation and study, he began exhibiting at the Salon in Lyon in 1872. 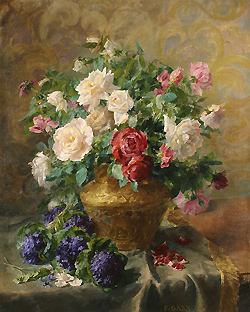 Interestingly, Garnier must have been sufficiently satisfied with his work in Lyon that he did not begin exhibiting at the Parisian Salon until 1898 with Roses (Roses), over twenty years after he began exhibiting in Lyon. And while many artists chose to relocate to Paris in search of a richer artistic environment, Garnier remained rooted in Lyon during this period. All of this suggests that Garnier had ties with the textile groups in the city as his preference for flowers may have been linked to his work in industry. Surprisingly, it is possible to find only one Parisian Salon entry for Pierre Garnier. For this reason, he should be considered of a provincial artist who was primarily a still life painter of fruit and flowers, themes with a long history. During the latter half of the nineteenth century, even such avant-garde artists as the Impressionists and Post-Impressionists still continued to paint still life, mainly of flowers, but also fruit, such as those painted by Paul Cézanne. Over time still lifes had been transformed; in their earliest incarnation the emphasis was placed on an almost photographic rendering of each detail of the compositional elements. With the liberation of artists in the nineteenth century, still lifes took on a more decorative style with a looser rendering of details. It is not known whether or not he treated other subjects since much of his work remains unidentified. His subject matter ostensibly found a receptive audience in those seeking paintings to decorate their homes. His work was primarily completed during the period of the Belle Époque which saw an explosion in the interest of decorating homes, so his work must have found buyers. There are many artists with the name “Garnier” but their relationship to Pierre, if any, is unknown. Perhaps he came from a long line of artists and was influenced from a young age to follow this line of work. Considering that he grew up in Lyon, which was a large art center in its own right, he may have been influenced by his family and other artists working in the city. But this awaits further exploration especially through the city archives, and the remaining records linked to industrial firms in Lyon. Despite any unknown details about Garnier’s life, he was continuing the still life tradition through the nineteenth and well into the twentieth century.